2;02 stopped out. Done for the day. Thanks for coming. See you next week. 12:43 in my own account I trade multiple contracts. I start buy buying one as a pilot when I see a setup on a pattern. Jesse Livermore used pilot trades to test the market. 10:55 when you trade, you are trading two things-the market and yourself; you will make errors; sometimes you can't tell if an entry is and error or not. But if you suspect it is, protect yourself from yourself. 6/3/2011 12:05:51 PM MT LEM:: Anyone short here? 6/3/2011 12:02:43 PM MT LEM:: And another crossover down; aren't the rules saying short here? 6/3/2011 11:48:59 AM MT LEM:: This is what is frustrating about trading moving averages; the back and forth whipsaws even the trade window doesn't seem to help. 6/3/2011 11:46:08 AM MT LEM:: Now crossover UP. Flatten and reverse to short didn't work either. 6/3/2011 11:35:18 AM MT LEM:: Looks like crossover down on 20 and 110ma right at the trade window time. 6/3/2011 11:34:15 AM MT LEM:: Ok; thanks; I see the trend continuation discussion. But if it doesn't dip and curl away now we get stopped out. 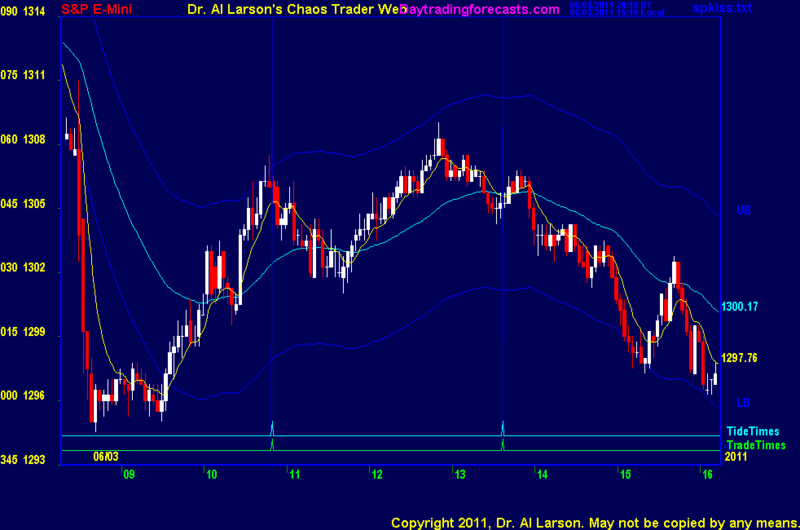 6/3/2011 11:13:47 AM MT LEM:: Please advise what you are looking at for setup for continuation buy.